One of the bigger surprise announcements at Sony's E3 2011 press conference was the news of a new 3D PlayStation-branded monitor set to be released later this year. Following the announcement that PS3 already boasts over 100 3D games, Sony now plans to release this new PlayStation branded 3D monitor and glasses, bundled with the new Resistance 3 game. The monitor has a 24-inch display developed to get the best 3D performance out of your PlayStation 3. Plus, it also allows two players to view separate screens, which means no more split-screen multiplayer gaming! Sony's new 3D display uses active-shutter tech and is set to be released with glasses and Resistance 3 later this year, priced $499 in the US (with UK pricing still 'tbc'). "3D Glasses included in the 3D Display bundle will also be sold separately, concurrently with the 3D Display, at RRP of US$69.99 in USA," Sony's E3 press release adds. 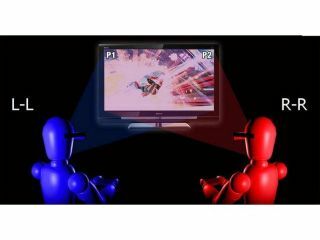 "Through the introduction of this new product, PS3 users will have easy access to all of their 3D entertainment by simply connecting PS3 to the 3D Display. "The 3D Display features a 24-inch full HD LCD display and, in an industry first for its size, the display adopts quad-speed frame sequential display technology that is able to minimize crosstalk distortion, delivering stunningly realistic 3D viewing experiences. The 3D Display supports several 3D formats, including "frame packing," "top and bottom" and "side by side," which will offer users various options for enjoying 3D." Sony's new 3D display also features high contrast (5000:1), a wide viewing angle (176 degree), a high response time (4ms GTG average) and high quality sound through two subwoofer speakers able to generate a broad range of sound from low pitch to high pitch.